Look what is available for you in the area. The house itself overlooks the lakes with the mountains in the background as pictured above where there are many walking areas within easy reach such as St.Kevins Way, the Wicklow Way and Glendalough. There is a new cycle track running from Blessington to Russelstown and bike rentals are available from Tom's Bike shop in Blessington and The Avon Ri. 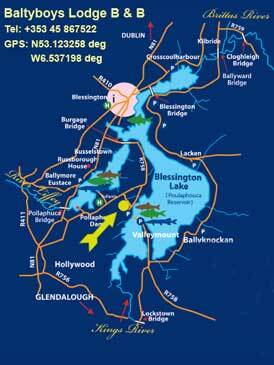 There is plenty of fishing in the area on the Lake, the Kings River and the Liffey River. Fishing boats are available for rent including rods and lake fishing licence. The lake contains Trout, Perch, Roach and Pike. 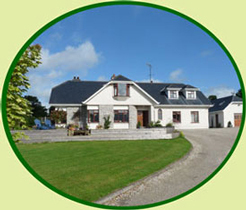 Two golf courses are within 2km of the house and this has proved very popular with our guests. 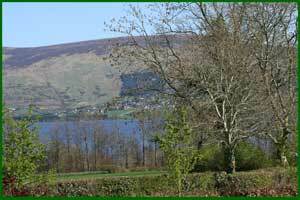 Canoeing, Sailing, Windsurfing, Horse Riding, Archery, Clay Pigeon Shooting, Pitch & Putt are all available close by. There are many restaurants nearby that will suit all budgets. Glendalough (24Km.) a must visit when in Wicklow, with St Kevins monastic settlement site and the wonderful and magical walks around the upper lake. There are numerous wonderful gardens to visit, such as Powerscourt, Mount Usher & Kilrudderey House and gardens to name but a few, all of which can by accessed by the very scenic Wicklow or Sally gap. Punchestown racecourse is 10km, while we are 40 km from Dublin airport & Dublin port. Local history about the lake Go back in time and beneath the lake.